It was during E3 2013 that I was first introduced to Octodad: Deadliest Catch. Watching the Playstation press conference via live stream, the flow of heavy and visceral games being announced was interrupted by a curious creation, Octodad. With the tagline “Loving father, secret octopus,” I had to know more. What followed was a video of an octopus, dressed in a suit and living in a classic nuclear American family, trying to do day to day tasks. It was pure, genuine hilarity, and I had to get my hands on it. 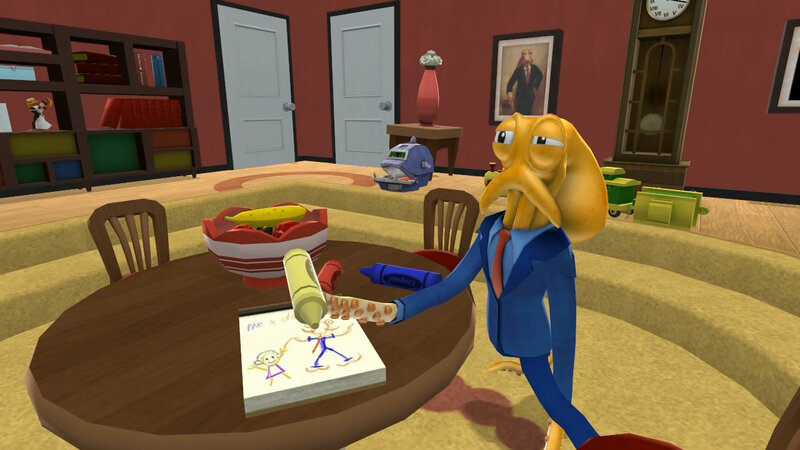 Octodad has you control the arms and legs of the titular main character as he continues his charade as a suburban father. You start the game with a wedding, dressing yourself and navigating the wedding hall, trying not to destroy too much on the way as you wildly flail your tentacles about in hopes of moving forward. The game offers challenges that range from the mundane (like mowing the lawn) to the more adventurous, like avoiding detection by marine biologists at the aquarium during a family outing, or outwitting a sinister chef who seems to be the only person who sees you for what you are. You flail and you flop and you fall flat on your face plenty. It is not an easy game, and it may very well have you swearing at the screen. Climbing a 30-foot obstacle course at the aquarium had me ready to throw my controller across the room (I highly suggest the use of a controller if you are playing on a computer rather than on a PS4), and I do not anger easily when gaming. But the sense of accomplishment when you finally land your tentacles at the top of that jungle gym is more than worth the effort. Octodad is a wholly silly game. In no way does it take itself or its content seriously. You are an octopus dressed up like a dad, and you are tasked with doing things an octopus dressed up like a dad would logically do, if any semblance of logic could ever be applied. It’s just good, clean, family fun and that’s something gaming has seen a regretful lack of in recent years. With mainstream gaming being dominated by gritty shooters about shooting gritty people, it’s nice to have a game about squibbling unintelligibly while struggling to play soccer without any bones. You can pick up Octodad: Deadliest Catch on Steam or the Playstation Network.